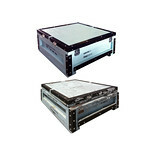 Before and after images of boxes received for refurbishing. All of the damages seen were able to be repaired with new materials and hardware. All boxes are repainted after repairs.